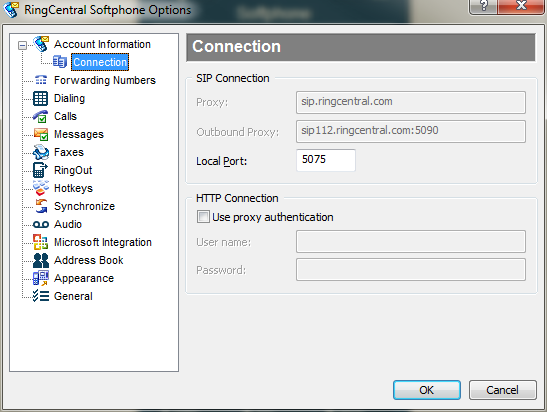 I’ve recently been trialing RingCentral, and on the whole I like what I’ve been seeing. One problem had me beaten for over an hour today, and it turned out one simple change was all it took to fix the problem. 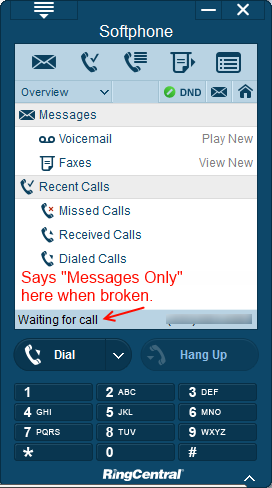 I share an office with a number of colleagues who are also using RingCentral, so I was particularly confused when my SoftPhone said “Messages Only”, and yet they were showing “Waiting for Call”. With my colleagues connecting fine, I was pretty confident it wasn’t our internet connection or router settings. And given the connection worked fine for me last week and I hadn’t changed anything on my computer, I didn’t think I could blame any security or other local software for making a mess. I went on a wild-goose-chase with an Office upgrade (from 2010 to 2013) since for some unknown reason RingCentral uses Office under the hood, and that also didn’t get me anywhere. Eventually I relented and called their support team. The solution was a 10 second fix – change the Port Number to 5075 instead of the default 5060. It turns out that RingCentral’s SIP servers use a port allocation of 5060-5090, and because I was using the default 5060 my connection had been “corrupted” (this was the word the agent used; I think “overloaded” would be a fairer description). It could also have been caused by my local router getting confused from a NAT basis, but I didn’t stay in my Telecommunications Engineering degree long enough to learn the intricacies of routing with UDP. Why their “success” help page didn’t contain this suggestion is beyond me. And I’ve lost over an hour getting to this point. Hopefully this helps someone else. So, in summary, if you’re having trouble with the “Messages Only” status simply try a new random Local Port between 5060 and 5090, and hopefully your connection comes back in 10 seconds just like mine did. This entry was posted in Uncategorized and tagged RingCentral by Geoff. Bookmark the permalink.